Cinch Connectivity Solutions has announced the commercial availability of its C-ENX Galley Connector, ARINC 810. 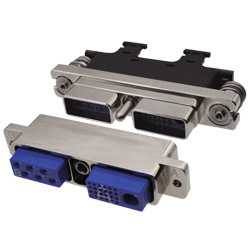 The connector is designed and constructed to the ARINC 810 standard for use in commercial aerospace galley applications. The scope of this specification meets all current functional catering components, which includes beverage makers, ovens, and refrigerators. The connector uses a floating mount for the plug side for blind mating to the receptacle on the aircraft side. The two-insert assembly includes a six-pin power contact insert and Quadrax insert with 24 signal contacts for enhanced power and electrical functionality and versatility. The company’s line of these connectors provides for optimised stacking and space reduction compared to circular connectors. Modularity decreases rework and complexity because the same panel cutouts are applied on all variations. Nickel and aluminium-plated shells protect and lessen weight. Modular, interchangeable and intermateable parts, along with blind mating guarantee a fully sealed connection that avoids improper mating.